After a full year’s break, Imajin Advertising is here again with one of the nation’s biggest and most successful gospel concerts of all time; MTN Ghana Stands In Worship (#GSIW) – 2015. The event that brought together thousands of Christians, unbelievers, music lovers and people from all walks of life together in 2013 towards a simple goal – to worship – is set to hit the capital again come Saturday 10th OCTOBER, 2015 at the Accra Sports Stadium; 6pm prompt. 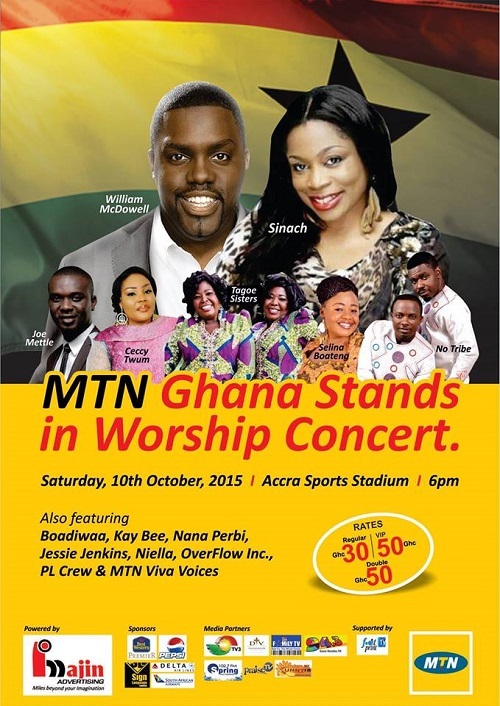 “A lot of surprises and an unforgettable worship encounter await Ghanaians on the 10th of October 2015″ he added. This year’s GSIW experience also features a book fair where Christian literature will be on display for sale. Mr. Kojo Soboh, head of events and promotion, also in an interview indicated that, though #GSIW is planned to be a yearly event, due to some technical hitches, Imajin could not run it last year. So instead of putting up just any show together, ad-mist the hitches, it was rather shifted to this year, to enable all the major hitches to be resolved and to be able to deliver another great event full of positive testimonies. Tickets for this year’s event goes GH¢30(Regular), GH¢50 for double and GH¢50 (VIP). Next articleFix The Economy – Presbyterian Church Tells Govt.